Potatoes are a root crop from the Solanaceae family. They are the world's most widely grown tuber crop, but like other members of the family, they vulnerable to many diseases. Crops from this family should never been grown in the same space for two consecutive years. There are about 200 wild potato species, all native to the Americas. Potatoes were domesticated in present-day Peru, where they have been grown for over 7,000 years. They were introduced to Europe in the 16th century; the first record is in 1570, from Seville. 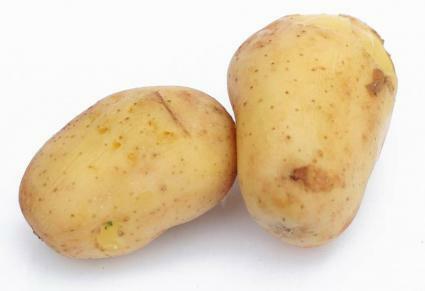 Potatoes contain solanine and chaconine, which are toxic to humans if ingested in large amounts. Cooking at high temperatures (over 340° F) reduces the amounts. Solanine is more concentrated in potatoes that have turned green or have sprouted. It may seem silly to grow potatoes when they are cheap and easily available at the local supermarket, but there are many advantages to growing your own. Home-grown potatoes are usually a more healthful food, since home gardeners can limit the chemicals used in growing. You can sample the many varieties of potatoes not widely available commercially - potatoes can have brown, yellow, pink, red, purple, or blue skins, and the flesh can be white or the same color as the skin. Potatoes with purple, red, or blue flesh have a high level of antioxidants; 'Purple Majesty', which was first marketed in 2005, is especially rich in them. Best of all, if you grow potatoes in your own garden, you can treat yourself to 'new potatoes', tiny tubers no bigger than your thumb. They are considered delicacies in many cuisines. 100 to 120 for mature potatoes; new potatoes can be harvested earlier. Potatoes grow best in cool climates, where they are a summer crop. The foliage grows first, while the weather is warm, and the tubers form as cooler weather arrives. In warm areas, potatoes can be planted in late summer for a late spring harvest before hot weather arrives. Potatoes like a sunny spot. 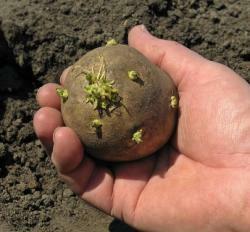 Potatoes should be watered regularly if the area does not have frequent rainfall. The soil does not have to be especially rich, but it should have good drainage and be well aerated. Heavy clay soil drains poorly, which encourages the tubers to rot. Potatoes like a slightly acid soil, with a pH between 5.0 and 6.5. Potatoes are referred to as 'new', 'earlies', or 'main crop'. 'Main crop' potatoes store well. 'Fingerlings' are small potatoes with a long, narrow shape, rather like fingers.You can get new, early, and main crop potatoes from the same planting by harvesting at different times. Pull up a few plants while the tubers are small, or gather a few from each plant and let the rest mature. If you don't want mature potatoes to store, plant twice a few weeks apart and enjoy a constant supply of new potatoes through the harvest season. Potatoes are grown from the sprouted 'eyes' of other potatoes. You'll have the best results if you buy certified disease-free seed potatoes every year. Cut the seed potatoes into pieces, making sure there is at least one sprouted eye in each piece and enough flesh to nourish the sprout's early growth. To prevent rot, let the cut pieces sit in a cool, dry place for a few days while the surfaces harden, or dust them with a fungicide. You can plant potatoes several weeks before the last frost date as long as the ground is not too wet. Dig a trench about six inches deep and place the pieces of seed potato about a foot apart with the eyes facing up. Cover with about four inches of soil, so that a shallow trench remains. Some gardeners plant potatoes on top of the soil and cover them with mulch as they grow. Others prefer to grow them in large containers - garbage cans, barrels, plastic tubs - that can be gradually filled with soil. Green foliage will appear in a few weeks - sooner, if you don't cover the seed potatoes very deeply. When the foliage is four to six inches tall, start adding soil, hoeing it from each side of the row onto the plants almost to the top of the leaves. This is called hilling. Keep hilling every week or so until the plants are at least a foot tall and flowers start to appear. Water regularly while the plant is growing, but not after the foliage has started to die back. You can harvest new potatoes as soon as the tubers form. Check by gently digging around the base of the plant with your fingers.The tubers are mature after the foliage has died back. They can stay in the ground for a few weeks if the weather is dry and no heavy frosts are expected. To harvest, use a digging fork or a potato hoe and start from the outside of the hill. Dig carefully, and get down under the potatoes so you don't scratch them as you lift them out. Work on a dry day when the soil is quite dry if possible. Let the potatoes dry for a day or two before storing them. They should be kept somewhere that is dark and cold but not freezing, slightly humid but not damp, and well ventilated. Don't wash potatoes before storing them, and don't pile them more than a foot deep. Potatoes are vulnerable to pests and fungus disease. Colorado potato beetles, flea beetles, and aphids can be picked off by hand, or the foliage can be dusted with insecticide.The worst fungus is 'late blight' which caused some of the most extensive famines in European history. If the foliage becomes blackened and then moldy, it has blight. Burn it, or send it to the landfill, and wait a few weeks before digging any potatoes that are under the soil. Avoid blight by using clean seed, rotating crops, and using fungicide. A variety of purple potato now being studied in England seems to be almost totally resistant to potato blight.